Another chapter of the Chicago Dancing Festival closed, and while I’d love to say that I was spending all sorts of time trying to process it – well – I’d be a liar. The day job hit me like a ton of bricks after my visit to the Auditorium Theatre last Thursday. You know, life gets busy, but I would be amiss to not mention a few amazing things that happened that night, and at the Festival in general. The theme on Thursday was “Dancing in Chicago” but I might rather have called it “Sweden and Spain”. Two works inspired by Picasso, a Tarantella, and two Swedish choreographers (Mats Ek and Alexander Ekman) made for a surprisingly cohesive evening. Ensemble Espanol’s Bolero was a piece I had seen earlier this year at Spring to Dance, and while it’s an explosive and vibrant piece chock full of nearly every flamenco move possible (and the fans, capes, shawls, dresses, and the fancy shoes that appear throughout the piece), I’ve never really connected with the music by Maurice Ravel (maybe because two of my high school friends were percussionists and loathed the snare drum part), and I therefore didn’t connect with the piece. Seemingly random projections of Picasso’s paintings didn’t compliment the stunning performances from this huge company dressed in all red, nor did the abrupt change to silhouette toward the end of the piece. Surprisingly, Lar Lubovitch’s Transparent Things was more closely connected to Picasso than Bolero. I was pretty skeptical reading the program during intermission when I noticed that a piece about Picasso was set to French Impressionist music (especially after an underwhelming performance two days earlier at the Harris). But remember how I said that I don’t connect with Ravel’s Bolero? Well, Claude Debussy’s String Quartet in G Minor is a work I know well, and love. 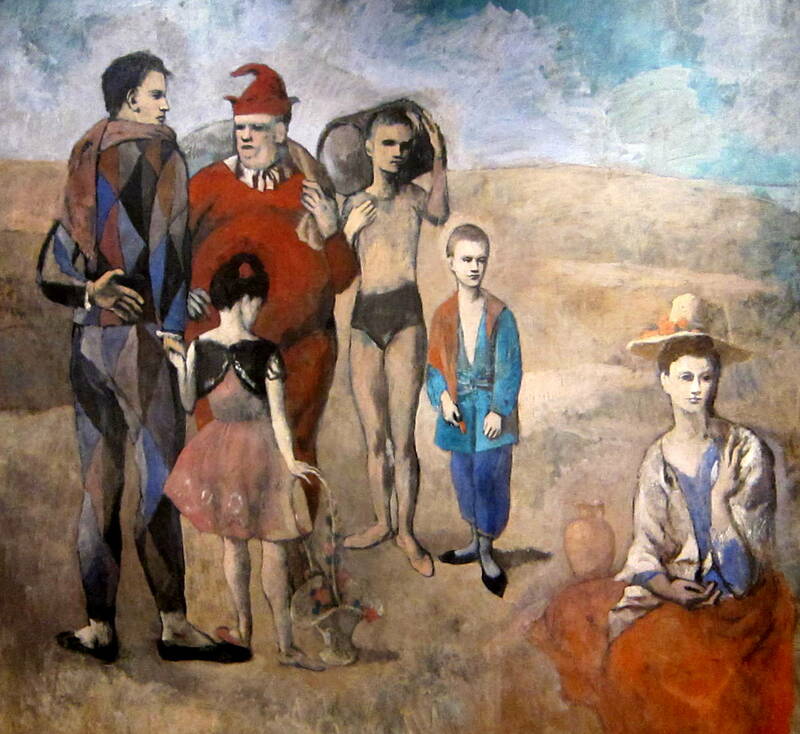 The smooth interlacing and intricate patternings of the dancers didn’t immediately read “Picasso”, who’s work I think of as angular and harsh, but the painting that inspired the piece is simple, realistic, and uses soft lines and colors to portray a grouping of eccentrics. The third movement ended in one of the most beautiful moments I’ve seen, with the dancers posing delicately around the musicians who played the score live. Frankly, the piece should have ended there; although the last movement was also lovely, it made the piece long and redundant overall. I don’t often stand in a theatre, but the Joffrey Ballet brought me to my feet (and my jaw to the floor) with the world premiere of Alexander Ekman’s Episode 31. That feeling that we all got when we saw Minus 16 for the first time? Yeah, that’s kind of how it felt. I don’t want to say too much, other than, if you haven’t seen this piece, watch the teaser and then buy yourself some Joffrey tickets pronto. I’m not exactly sure if it’s a good idea to premiere a piece of this magnitude at a free festival who’s audience might not see dance more than once a year, but maybe that’s another conversation. It was a good year for the Dancing Festival. Big names, exciting performances, and, for me, it ended with Thursday’s seriously mind-blowing premiere. The question is, perhaps, where will it go from here?